This beautiful Curvety dress is suitable for both Evening Wear and more formal daywear occasions. I am seen in the photo wearing the dress in black. The dress is also available in wine red (as pictured on the model). Both dresses are now reduced to £40.80 in the Curvety Sale. I love this dress because it has very elegant detailing and offers a slimming profile. Both the colour and styling help with this. Black is a permanent choice for the plus size lady as a slimming block colour but with this the 3/4 length sleeves and the boat neck style neckline with the knotch cut away provides for a more ladylike and sophisticated presentation. I am 5' 9" tall and I am wearing a UK size 18 which is true to fit. The dress is fully lined and is 108cm [ 42 1/2in ] length from shoulder to hemline. For a 20 second view of the dress CLICK BELOW. To see the dress being modelled and to hear me review it fully , have a look at the video below. This is the Leona Dress in Noir/Black - a long sleeve black lace dress from Curvety. I have featured Curvety many times now on www.plussizeclothing.co.uk as they are a quality retailer selling beautiful and different clothing in the size range UK16 to UK32 (and sometimes up to size UK36). They will therefore offer plenty of variety and choice to the discerning customer looking for something a bit special for herself. Although not just quite a household name yet, Curvety's clothing is becoming very popular. As a result of this sometimes new clothing items and styles that are introduced on the website can sell out quite quickly. Don't be alarmed though that you've missed a certain item, because stock is immediately replenished and you can be lucky and get the item that you initially wanted - that size having only been out of stock for a couple of days. With regard to today's dress, I am 5' 9" tall and I am wearing this dress in size UK18. You can see the fit is perfect. This dress is fully lined and beautifully cut to enable you to walk and sit with confidence (please see my video below; it shows me demonstrating both the walking and sitting tests). This dress can be worn to many types of occasion, including both formal daywear and evening wear occasions. The addition of a fascinator or larger brimmed hat treatment will take this dress into the very special formal daywear category. Whilst on its own (as modeled in the photo above and video below) it is suitable for a Cocktail Party or other evening occasion. This lovely IGIGI designer dress has just been reduced in the sale at Curvety to £87. Grab this beautiful and very special creation by Yuliya Rachel now, as some sizes are selling out fast. I am 5'9" tall and I am wearing the dress in size UK16. This is my own dress and I have got lots of occasion wear use out of it. 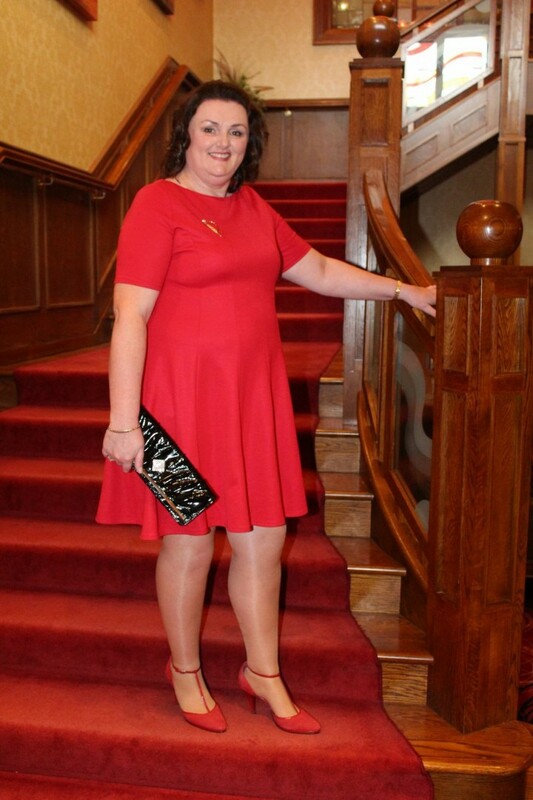 I have been a customer of Curvety for some time now and therefore I am delighted to talk about and endorse this dress and all clothing from Curvety, having "tried and tested" lots of their clothes. The dress is available from plus size UK16 to plus size UK36 but as I've said, and as you can imagine a dress of this quality, especially now that it is in the sale, is selling out very quickly. Please however do not be discouraged if you cannot get this dress in your size. Often Curvety will replenish stock very quickly and for very popular styles they can often offer you a very close alternative. I model the dress in the video below. Click on it to hear what I have to say. It is now mid May and that time of year when you start thinking about what to wear at formal occasions such as graduations, weddings, corporate Race Meetings or Garden Parties. I have introduced you to the wonderful and very different line of clothing from Curvety before on www.plussize.co.uk. It is now time to remind you all of where to shop for your plus size special occasion dresses, accessories and all other clothing items, as Curvety are still selling the same high quality clothing from a size UK16 up to a size UK32 (and sometimes certain items go up to a size UK36). Currently there is an up to 65% off sale on at Curvety so NOW is the time to bag that bargain. I am a customer of Curvety myself so can stand over what I say about their wonderful designs and the high quality of their garments. You get what you pay for. Curvety sell affordable designer clothing so you can be confident that you will not see someone wearing the same dress as you at your special occasion. As is always the case at Curvety, lines sell out quite quickly but please do not be discouraged as popular items frequently come back into stock again (if only with a slight variation in colour or design detail). I have 4 special dresses to blog about over the next couple of weeks. I'm featuring this dress (the Angelina Dress in Navy) today but please also check back here very soon to see my other finds from Curvety. Today I am wearing the Angelina Dress in size UK18. I am 5'9" tall. I think this dress looks georgeous and makes me look slimmer This slimmer profile is helped by the dark Navy colour and also the band detailing at the waistline. I love the pretty neckline which is deep enough for wearing pendant style necklaces up to 18". Another feature that I really like is that the dress is fully lined - there's no need for an array of extra under garments. I'm modelling a lovely dress for summer from the M&S Collection at Marks & Spencer. This is an embroidered tunic dress in a linen mix with a paisley style embroidery. The embroidery is beautiful and makes this dress a real stunner for smart casual day wear. I am 5'9" tall and am wearing size UK18 which is true to fit. The dress ranges from size 8 to 22 and is new summer stock just arrived at M&S. I love tunic dresses because they hide a bigger tummy area. Personally I prefer the cut of tunic and wrap dresses. This dress comes in white (as pictured) with the real embroidery in blue. (This is not a print.) I feel the embroidery makes this a lot dressier for summer day wear. See below for a short video where you can hear my review of the dress.